Delicious! At last we get invited to the same dining table with Dr. Lecter to see exactly how well he entertains his guests. Realizing the well-bred tastes he has developed and maintained in so many areas (exemplified by his appreciation of art and music as well as good food), it should be no wonder that his dinner parties are a mind-lifting experience. This film escapes comparison to its forerunner in many ways. 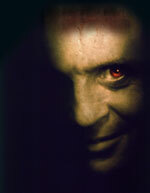 Both are successfully rendered, but "Silence of the Lambs" depends more strongly upon a subtle, psychological approach to the matters at hand, whereas the new "Hannibal" terrifyingly reverts to portraying actual deeds and turning the hidden horrors of the medical man into a visual experience for all. The apparition of an ex-victim shortly after the film begins is something with which the viewer must contend as he slowly, but surely becomes prepared to accept such confrontations more readily. Cleverly deceptive in its introduction, this relationship adjusts the viewer's mind so that each one of the newest horrors become less jolting than it could otherwise have been, incredible as this thought might seem). Dr. Lecter (Anthony Hopkins) escaped his confinement in a maximum-security hospital for the criminally insane ten years earlier. His sixth victim, Mason Verger (Gary Goldman), survived his personal ordeal with a hideously disfigured face and has dreamt of revenge upon the doctor ever since. When the imaginative Lecter gave the drugged Verger a mirror shard to cut off laps of skin from his face and feed them to his dog, the victim acquiesced ("It seemed like a good idea at the time.") Having inherited his family's fortune in the meantime, Verger now uses his imagination to devise methods of retribution. Corrupt Justice Department official Paul Krendler (Ray Liotta) also serves as a tool in Verger's plan to force FBI agent Clarice Starling (Julianne Moore) into a position where she will become bait for the hungry doctor. A greedy Italian Detective named Pazzi (Giancarlo Giannini) gets the wheels turning in Florence earlier than expected when he plans to bag the Doctor and a reward at the same time, a plan that puts him as well as his wife, Allegra (Francesca Neri), in danger. It is obvious to Dr. Lecter that Clarice will be on his trail again because he sent her a clue to assist in tracking him down. The statures of these two characters, each bound with a heightened sense of morality and strength of resolve, are responsible for the deep appreciation they have of each other. Clarice, dedicated to the pursuit of righteousness and the ultimate punishment of evil, will do everything in her power to see that Lecter comes to his justly deserved end. Lecter appreciates the honesty of her character and the purity of her nature in this pursuit, but is he not equally pure in his pursuit of punishment for others and completely honest in the expression of his goals? Perhaps these are some of the reasons that make Clarice apparently accept his method and manner of escaping pursuers, although she remains determined to put an end to his activities. Lecter shows an aptitude for righteousness in handling the unfair practices of unjust oppressors by implementing what he considers a suitable reward for each one. The mutual appreciation emanating from these two opponents (Hannibal and Clarice) unquestionably results from their impressive statures. Both possess a steadfast determination and sense of purpose. Their story is similar to an inverted love story in which two people are tied together by their admiration and respect for one another and where the main emotions at play are fantasy and horror. Director Ridley Scott has added his unique touch to the proceedings. According to producer Dino de Laurentiis, "Ridley is a genius. He reminds me sometimes of Fellini because they both get a script in their hand, and create something new in every shot. There are two ways to make a movie: you make the movie like the script, shot by shot, putting together what is on the page. Or you create, day by day, a movie that is inspiration. That is what Fellini did in his time. That is what Ridley Scott does." Some may have difficulties making the transition to the introduction of Julianne Moore as the character of Clarice, but this should present no insurmountable problem. Both Miss Moore and her predecessor in the role, Jodi Foster, are first rate actresses and both have handled this role adeptly as written by the author and scenarists. The period of ten years that has transpired since the first film appeared should make this transition easier for the viewer, but those who dwell too much on the former will make it less easy to appreciate the experience of the latter. As Moore herself realizes, "Now, she's a ten year veteran of the FBI. So, that gives me a different place to start interpreting the character. She is quite a different person." When Jodi Foster had dropped out and several other names were being considered, Anthony Hopkins felt Julianne Moore was perfect for the role, but had no power himself in casting. "Then a few days later, Ridley called me and told me he'd cast her. And we were off and running." Hopkins is delightful (, if that's an appropriate term,) once again as the demented dinner partner and even more ironically droll in his creatively destructive deeds. Full laurels must also go to Gary Oldman who, despite wearing the face that bears no feature, manages to give a portrayal of silent vengeance and tempered humor equal in its evil devices to that of his arch enemy, Hannibal the horrible. Approximately 100 locations, including the Palazzo Vecchio, the Ponte Vecchio, the Palazzo Capponi, Il Duomo, and the Mercato Nuovo (home to the famed statue "Il Porcellino") as well as President Madison's farm in Montepelier and the Biltmore Estate in Nashville, create a amazing palette where some very unpalatable events take place. Music must also appease the learned man of means and so, besides the haunting and majestic score of Hans Zimmer, there is also an opera, just short of five minutes in length, titled "La Vita Nova" which was especially composed for the film by Patrick Cassidy. The script of Thomas Harris' novel is in the hands of David Mamet and Steven Zaillian. Great work by production designer Norris Spencer, DP John Mathieson, and film editor Pietro Scalia. Is this the gray matter of visual terror? If so, it's enough to make the appetite cringe. *Warning: It is probably not a good idea to watch "Hannibal" as an in-flight film.